Spinal decompression with the DRX9000™ is one of today’s most advanced technologies. We were one of the first to offer the DRX9000 in the Buffalo area and we continue to improve upon our success rates. Lumbar decompression involves the application of distraction forces to relieve nerve compression often associated with lower back pain and sciatica. Most often, patients have been unsuccessful when using traditional methods and seek an alternative to more invasive surgical solutions.Decompression patients receive 25-30 minute DRX treatments within a relaxing environment. During treatment, clients can listen to their own music on CD or watch DVD movies. Immediately following treatment, ice is applied to reconsolidate the soft tissue. Patients also gain personalized home-care coaching, with noticeable relief typically attained within just three weeks. Lumbar decompression with the DRX9000 is a safe, FDA-cleared treatment program that has been proven successful in numerous clinical studies since its introduction in 2002. Dr. Wright works with you to devise a holistic approach encompassing regular decompression, nutrition, exercise and relaxation strategies geared toward obtaining optimal results. As a result, a very high percentage of our patients find the solution successful. 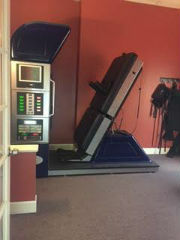 To learn more about our DRX9000 spinal decompression program, please call our Elma office at (716) 675-5776.